Lucerne has long been one of Europe’s most heavily touristed towns, five million admirers passing through each year. Wow! Just imagine the whole population of New Zealand passing through this picturesque town! We were there for one day and half day, too little; too short! If you are there, The north bank of the Reuss River is a must see! Take a walk among the river bank, take in the beautiful vista. May be take a nap beside the river! 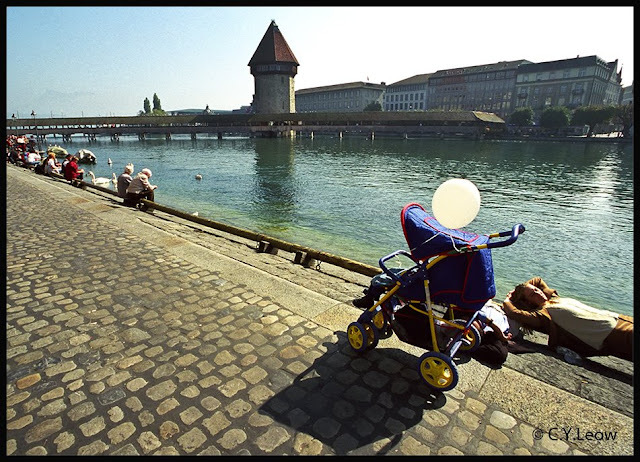 Beautiful fine day, cool breeze; along the river right smack in the city of Lucerne... great spot for a nap, baby included! This delightful snap was "napped" with a Canon EOS1n, EF17-35L zoom lens on Kodak Supra 400 film. The next photo was waiting 10 steps away! 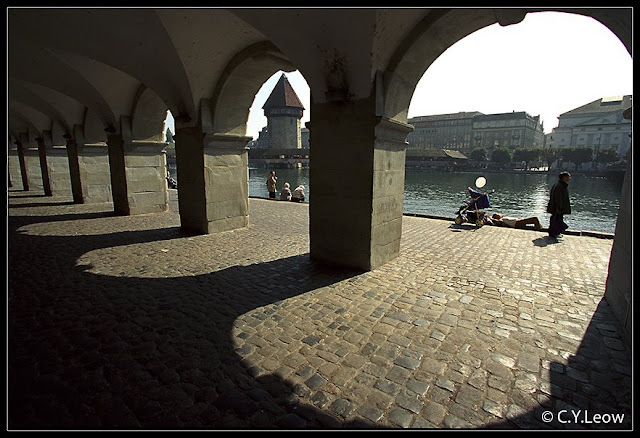 Same city, same river but shot from the back of these arches that support the building of stones. Can you notice the same sleeping mum? The low afternoon sun skimmed low and created a nice pattern on the cobble stone pavement. A Canon 14 mm ultra-wide was used to take in the expansive architecture. Lucerne, we hope to be back one day!